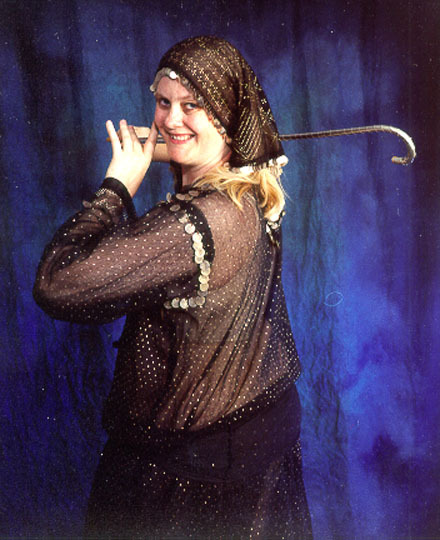 A triangular-shaped head scarf is the perfect accessory for many folkloric styles of Middle Eastern dance, including Saidi, debke, Nile Delta fellahin, baladi, Alexandrian, Red Sea (Esmailia), and others. Depending on the fabric and decorations used, the scarf can be either glamorous or very folksy. In the photo to the right, the scarf and dress are made of a fabric called tulle bi telli, often called assuit. A row of lightweight faux coins decorates the edges of the scarf. This costume would be appropriate for Saidi style of dance. Click on the photo to see the scarf in more detail. PHOTO CREDIT: This photo by John Rickman Photography, San Jose, California. Optional trim for outlining the entire scarf: 3 1/8 yards or 3 meters. Optional trim for the two shorter edges: 2 yards or 2 meters. See below for suggested trims. If you will be wearing this scarf with a specific costume, it can be a good idea to buy extra fabric for the dress so you can use the same fabric to make the matching scarf. Or, buy the same type of fabric as you bought for the dress, but in a coordinating color. The scarf can be worn without adding special trim to the edges, but many people like to add it. Some upholstery trims may work, but choose carefully. Some look tacky. 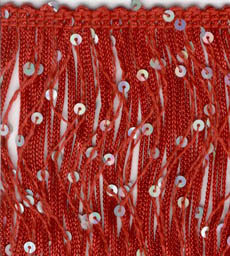 Avoid using beaded fringe like the kind sold for use on costume bra/belt sets. It's too heavy, and causes the scarf to hang badly. Open up the fold in the fabric and spread it out flat. Carefully cut with your scissors along the cut edge of the fabric to even it out to make a perfectly straight edge. Turn under 1/4-inch (6 millimeters) hem on all edges. It may be easiest to do the long edge first. Click here for instructions on how to make an easy hem. Some dancers like to turn this hem toward the right side, instead of the wrong side, then cover it up with the trim. This eliminates having a visible hem on the wrong side. The long edge (the hypotenuse) will be a bit stretchy because of being on the bias of the fabric. The easy hem at the above link helps control the stretch, and therefore make the hem on this edge easier to sew. If sewing fringe on the short ends, attach it before adding the trim around all the edges. This will allow you to use the trim to cover the top edge of the fringe. If sewing paillettes on the edges, attach it after adding the trim around all the edges. Cut a piece of fringe that is the width of the two short edges added together plus 3/4 inch (2 cm) extra. Turn under the band to the wrong side 1/4 inch (6mm) on each end of the fringe and take a few stitches to hold it in place. Stitch the band that the fringe is attached to onto the two short ends of the scarf. On each end, where the fringe was turned under, stitch back and forth several times across the turned-under section to make sure it will never have an opportunity to begin unraveling. Sew a row of single-strand sequin trim, soutache braid, or any other trim by the yard around the outer edge of all three sides of the scarf. Some trims can be attached using a sewing machine, while others look better if attached by hand. If the trim is narrow and lightweight, a second row can be added inside the first row, using a contrasting color. Alternatively, instead of sewing the second color all the way around all four sides, it could be placed on the short ends only, followed by a third row that either repeats the first color or introduces a third. Follow the instructions for the Dangling Paillette Trim to attach paillettes evenly spaced across the two short ends of the scarf. For a variation, sew about 6 or 8 paillettes to very center of the scarf on the long edge (hypotenuse). When wearing the scarf, the center goes across the forehead, and those paillettes will sparkle on the forehead. Knot the thread and draw through the edge of the fabric to the right side at one end of the scarf. String a paillette on the needle and pull it through. Take a stitch through the fabric about 1/2 inch (or 12 mm) away from the first one and string another paillette. Continue across. Keep the thread somewhat loose between stitches so that the paillettes or coins have some freedom to dangle. Click on the photo to see the coin trim on this scarf in more detail. Costuming for Your Hair. By Shira. Ideas for hair styles and headdresses. Making a Cleopatra Headdress. By Shira. Making a Pharaonic Costume. By Arabella. Includes instructions for making a beaded headband. Ask the Costume Goddess: Headdress Ideas. Suggestions for accessories to wear in the hair. Dangling Paillette Trim. One option for decorating the edge of the scarf. Bead-and-Sequin "Embroidery". One option for decorating the edge of the scarf. Ask the Costume Goddess: Hair Styles for Long Hair. Suggestions on how to style long hair for belly dance performances. Ask the Costume Goddess: Sewing Sequins On By Machine. Tips on using a sewing machine to attach sequins.